There is this simple moment that is essential to my understanding of Jesus. Sometimes I think we see him as almost a miracle-working robot, the unstoppable antithesis of the Terminator. He was sent to our Earth to save, heal, and point others towards God. And there are times in which Jesus declares that is the reason for whatever miracle he is performing. But here and in a few other places in the gospels we are reminded of his beating heart and thus God’s beating heart. The moment Jesus saw the widow mourning her son, he had compassion for her. Some translations say that his heart went out to her. He told her not to cry and he brought her son back from the dead. It’s that straightforward. Jesus saw the woman hurting, he hurt for her, and he brought healing to her life. He made death work backwards. He brought light where there had been darkness. Of the resurrection miracles reported in the gospels, the healing of the widow’s son is the shortest. The resurrection of Jairus’s daughter has a mini-narrative in which the father seeks healing for his sick daughter, Jesus travels with him, the girl dies, Jesus persists and raises her from the dead despite the mocking disbelief of the mourners. 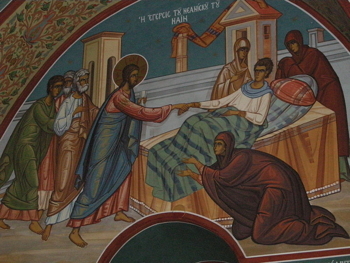 The resurrection of Lazarus is a critical part of John’s gospel. The story stops for those resurrections and that makes sense. Bringing people back from the dead is a big deal. It just doesn’t happen every day. Yet this one seemingly happens as Jesus is on his way to something else. Luke treats this story like it was a normal Tuesday. Yet maybe there is good news in the ordinariness of such an extraordinary event. Perhaps the writer of Luke is indicating that God’s compassion and God’s resurrection are not abnormal events. God has compassion for us in our ordinary days. And if compassion is the catalyst for resurrection then it means that resurrection can happen any day. The parts of our lives, the broken relationships, the hurting individuals can be brought to life on any ordinary day. In a world that regularly sees death and destruction, it is good news to hear that resurrection is common as well. This post originally appeared on Wilcomoore as part of the Weekly Lectionary series.